It’s white and cold and wet and it attacks my paws. Mrs. Human said I should take a walk outside. Is she kidding, it is an attack on one of my remaining lives, and I like to keep my lives handy, you never know. There are only five of them left. I am sure that freezing white stuff is after one of the five. OK, I did attempt a walk, but on the edge. I had a quick look back and saw that the window was open and Mrs. Human had gone, so I re-entered my home. I did not want to be called a coward, I am not a coward. There are just some things in a cat’s lives, that you avoid. I know some of my feline relations love the snow, they roll in it and even compare paw prints. I am not one of them. I like my life to run in organised paw tracks where the paths are clear and you can see where you are treading. Imagine in snow my whiskers would freeze and break, my nose would have icicles hanging from it and my claws would be iced in my paws. 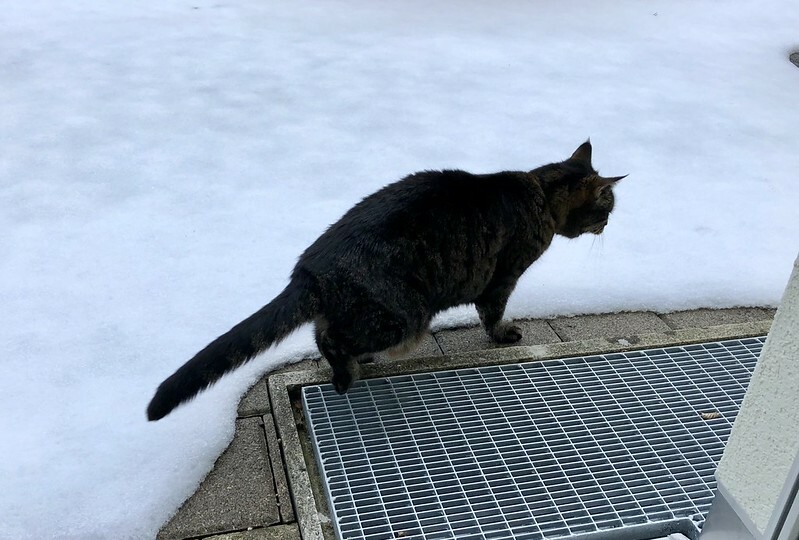 No, this snow thing is definitely not typical for felines, I even prefer the leaf soldiers in Autumn, I can kill them by jumping on them when they fall from the trees. You cannot kill ice and snow, only the sun can do that, and I do not like the sun on my fur, so it is better when I remain indoors and relax and sleep. Sleep is the remedy for all problems. Mrs. Human is convinced it is better to take a walk because it is healthy. I am healthy, I get the hard indigestable vitamin pellets every day in my food. Now that is another problem we felines have and I must remind Mrs. Human that the word “healthy” does not exist in meow. I Lucy also do not like snow on my paws. Now that I am almost twenty, I do not go out when it is cold. I think I may only have on life left and do not wish to waste it on snow. Tell Mrs Human that healthy and cat is redundant, which is why we do not speak it. Mrs Human does not listen, and only knows human logic which is completely wrong. You have to be careful with the lives, although one day we will get the 10th life and that will last forever. Just wait for the snow to melt and count mice in your dreams to pass the time away. I’m with you, Tabby. Not putting MY naked paws into that snow either! Parker wonders about this ‘snow.’ We don’t have that here in Florida. Tell Parker he is not missing anything. The only good thing is when it melts you can drink it.